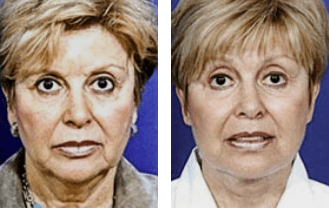 WHAT IS A PSP (PLATYSMA SMAS PLICATION) FACELIFT? Traditional facelifts do just what their name states: to reverse wrinkles and other signs of aging, they must lift up the skin of the face, often resulting in an artificial or “windswept” look. Revolutionary new facelift techniques now enable individuals to have a refreshed, rejuvenated appearance without the obvious tightness of a traditional facelift procedure. These groundbreaking procedures utilize the fibrous extensions that attach through the subcutaneous fat layers of the face to the epidermal (outermost) layer of the skin. This Superficial Muscular Aponeurotic System (or SMAS) allows the three layers of facial skin to move together as a single unit. SMAS facelift procedures redistribute the fatty tissues of the face, thus rejuvenating the skin and reversing signs of aging while ensuring that your face retains its soft, natural beauty. The PSP, or platysma SMAS plication, facelift enables a capable surgeon such as Dr. Moelleken to redistribute the fatty tissues of the face with less recovery time than other SMAS procedures, making it the perfect procedure for individuals who are concerned about finding time for a cosmetic surgery in their busy schedules. Like other SMAS procedures, the PSP facelift corrects natural signs of aging such as: sagging in the cheeks and along the jaw bone; fleshy jowls or a double chin; and the development of prominent creases from the nose to the angle of the mouth. While the PSP facelift does not address signs of aging above the cheekbone, it is perfect for individuals who are primarily experiencing the signs of aging around their nose, mouth, and jawbone area. 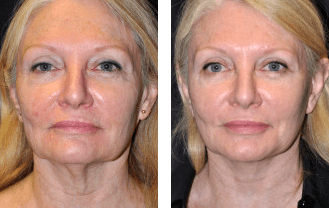 Because a PSP facelift involves working deep within the structures of the face, it is absolutely critical that you select a surgeon with extensive knowledge of the delicate facial structures and a high level of experience working with state-of-the-art surgical techniques. Dr. Moelleken is twice board certified in plastic and reconstructive surgery, and one of only three surgeons in the world to complete the year-long Aesthetic Surgery Fellowship at UCLA. He and his staff at Moelleken Plastic Surgery in Beverly Hills and Santa Barbara will listen closely to your needs and develop a unique surgical treatment plan that will treat the symptoms of aging and leave you looking youthful, revitalized, and naturally beautiful. Traditional facelifts specifically address the problem of skin laxity in the superficial skin layers, and often produce a tight, pinched look. Like other SMAS facelift procedures, the PSP facelift corrects signs of aging by redistributing the fatty tissues within the face, pulling the structures of the face upward instead of backwards, thus ensuring more natural-looking results and decreasing the potential for the “windswept” look of traditional facelifts. PSP facelifts are performed under general anesthesia or IV sedation, and may take several hours (depending upon the complexity of your surgery). The procedure involves lifting the upper layer of skin off the platysma muscle (located on the neck) and the SMAS layer along the cheek. Using permanent sutures, the surgeon stitches, or “plicates”, the layers of facial tissue onto themselves to rebuild and restore their natural shape, then reattaches the skin. Unlike other SMAS facelifts, the PSP facelift does not involve the underside of the platysma muscle, resulting in only one layer of scarring and less post-surgical downtime. However, as with all facial surgeries, patients can expect to experience some bruising, swelling, and discomfort, and should take care to limit physical activities until they are sufficiently healed. Dr. Moelleken always strives to be candid with his patients. The benefit of PSP (platysma SMAS plication) facelifts may not be any greater than fat transfer alone. There is no good scientific evidence suggesting otherwise. Nevertheless there is great interest in the procedure and Dr. Moelleken has incorporated it into his practice. At Moelleken Plastic Surgery, we will ensure that you will receive the only highest quality of care throughout your aesthetic enhancement experience. Our top priority is providing our patients with safe, effective cosmetic surgery procedures and ensuring beautifully natural-looking results. Our experienced and caring staff understands how precious your time is, and will take care to ensure that your surgery fits conveniently into your busy schedule. Dr. Moelleken will provide a comprehensive overview of your treatment options and procedural details, creating a customized surgical plan designed to address your specific needs and give you the naturally-beautiful face you desire. If you would like to learn more about the PSP facelift and whether it might be right for you, please contact Moelleken Plastic Surgery today. We look forward to speaking with you, and to scheduling your initial consultation with Dr. Moelleken.